Whether you're an IT pro or the go-to geek in your social circle, often the biggest hassle in fixing a computer problem is simply getting to the PC that needs help. Fortunately, Microsoft offers a few good Internet-based options that simplify the task of connecting to a troubled system. With Remote Assistance, Remote Desktop Connection, and Problem Steps Recorder, you can control a remote PC as if you were sitting at the keyboard in front of it. Not only do these tools save you a drive, but they also help you avoid scenarios where you try to help out a friend who can't seem to use menus properly or identify settings and dialog messages accurately. Instead of guiding a clueless soul to Control Panel and beyond, you can drive the controls yourself and fix problems quickly. Remote Assistance lets you provide safe and secure tech support for distant computers, whether for your company or for friends and family. 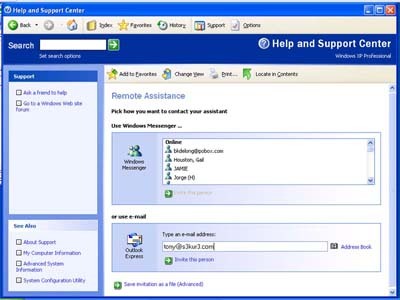 Unlike many remote-access tools, Remote Assistance doesn't open a user's Windows PC to the Internet so that any outsider can connect at will. The user must initiate the Remote Assistance request and approve the incoming connection. This tool has existed since Windows XP, but it has evolved a bit during the transition from XP to Vista to Windows 7. In Windows 7, click Help and Support, select More Support Options at the bottom of the window, and choose Remote Assistance. To find Remote Assistance in previous versions of Windows, click Help and Support and run a search for it. Once you've opened Remote Assistance, you can choose how to send a request for help. The method and format of the request have changed over time. In Windows XP, the choice is between instant messaging and e-mail. In Windows 7, you can opt to send an e-mail, save the invitation as a file to be sent as an attachment, or use Easy Connect, which establishes a relationship between two Windows 7 systems that can then connect via Remote Assistance instantly. Selecting the e-mail request option opens the user's default e-mail client and creates an e-mail message requesting help, along with a file attachment that the recipient will use to connect to the computer needing assistance. In Windows XP and Vista, the system prompts the user to create a password for the remote helper to use in order to connect with the PC; Windows 7 creates its own (ostensibly more secure) password. After you receive and click on the attachment, you must enter the password to start the connection to the remote PC. At this point, the person who asked for your help will see a prompt requesting permission to establish the incoming connection and warning that the connection will allow you to see everything on their Windows desktop. 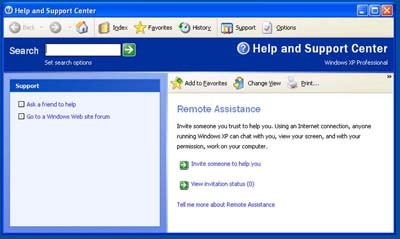 As long as the Remote Assistance session is connected, both you and the person you're helping will be able to see the same Windows desktop. A chat function lets you communicate with each other to troubleshoot and resolve the problem.